I spend a good amount of time talking about the food in Austin, but I can’t think of a simple way to describe it. I can tell you that whenever I’m out of town for a few days, I always look forward to getting home so I can grab a breakfast taco with spicy salsa. It’s been exciting to see the changes in our local food world since moving here over two decades ago. There are so many new flavors and cultural influences in our restaurant offerings now than there were then. And, there’s a full spectrum of quick and easy food from food trucks and casual spots to the creative dishes at fine dining places. I couldn’t wait to read how our city’s food was described and which recipes were included in the new book The Austin Cookbook: Recipes and Stories from Deep in the Heart of Texas by Paula Forbes. Of course, there’s barbecue and tacos and Tex-Mex, and there’s so much more. The recipes are mostly from restaurants both old and new, and a few are from the author. Brisket and carnitas make prominent appearances. But this is Austin, so there are also Tacos de Hongos made with a mix of mushrooms and poblano strips and Butternut and Goat Cheese Chile Relleno topped with pistachio cream and pomegranate arils. The Texas Standards chapter moves from The Broken Spoke’s Chicken Fried Steak with Cream Gravy to Contigo’s Okra with Walnuts. One of the New Austin Classics recipes I want to try is the Grilled Quail with Green Mole from Lenoir. There’s a chapter for Breakfast and Brunch that includes a breakfast taco primer with plenty of information for making your own. At home, I tend to start with corn tortillas and fill them with scrambled local farm eggs and whatever vegetables are in season, but they’re extremely customizable. It’s no surprise to see margaritas and the Mexican Martini in the Drinks chapter, but I was also delighted to find one of my favorite Juiceland orders there as well, the Wundershowzen Smoothie made with spinach, natural peanut butter, and hemp protein powder. There are also salsas and baked goods, and happily the Banana Pudding is a made-from-scratch version from Daniel Vaughn at Texas Monthly. As I was deciding what to cook first, I kept coming back to the Bob Armstrong Dip from Matt’s El Rancho. It’s a classic Tex-Mex restaurant, and queso finds its way to almost every diner’s table. Bob Armstrong, a former Texas land commissioner, was a regular at the restaurant and requested something new and different on one occasion. Queso topped with guacamole and beef taco filling was the new creation served just for him, and now it’s on the menu with his name on it. In the recipe head note, there’s a suggestion for making a vegetarian version with pinto beans instead of beef taco filing. I had just cooked some pinto beans that were stored in my freezer so I liked that vegetarian direction, and then I took it one step further and made a vegan version of queso as well. The day I made this, I posted a photo to Instagram and asked if this was an Austin-sacrilege or quintessential-Austin? My defense is that the processed cheese-like product often used to make queso isn’t really cheese anyway, so why not make something completely from plants instead? I did a little searching and found a couple of vegan queso recipes (here and here) to use as starting points. The primary ingredients were soaked cashews and grated potato. My biggest worry was that I was going to end up with an unappetizing color. I added ancho powder and a pinch of turmeric to bring out the reddish-yellowish look of it. To start, unroasted cashews were soaked in water for several hours. A medium potato was peeled and grated. Olive oil was warmed in a saucepan, and diced onion and minced garlic were added. After cooking for a few minutes, the grated potato was added and stirred to prevent sticking. Cumin, ancho powder, granulated garlic, a pinch of turmeric, and a chopped chipotle in adobo were added. Last, the drained cashews were added. Once the vegetables were cooked through and tender, the mixture was transferred to a blender, and a little apple cider vinegar and some water were added before blending to a smooth puree. I let the blender run an extra minute to get it as smooth as possible. The queso was returned to the saucepan to sit over a low simmer to stay warm. Diced red bell pepper, diced roasted poblano, and diced seeded tomato were added. To serve, the queso was poured into a bowl and topped with a scoop of guacamole, seasoned pinto beans, sliced jalapeno, and chopped cilantro. It’s a happy day in my kitchen when the smells of roasting poblanos, chopped garlic, fresh from the garden cilantro, and sliced jalapeno are mingling in the air. It automatically makes me thirsty for tequila with lime juice. This loaded queso was a meal in itself with lots of chips for dipping. The texture matched that of regular queso, and the flavors hit all the right notes. And, those are just some of the flavors I love in Austin restaurant food and at home. Note: The queso recipe in the book includes all the dip components with instructions for the beef taco filling and guacamole. The queso itself, in the book, is made with shredded American cheese. 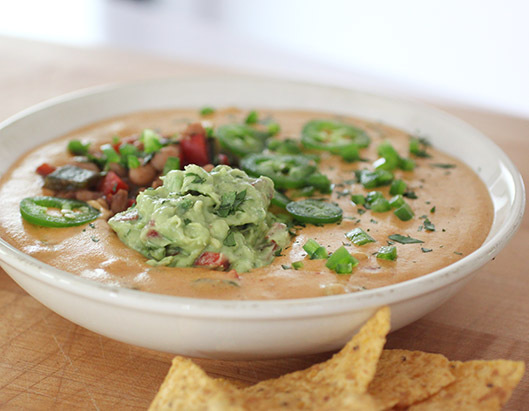 The following recipe is the Vegan Queso I chose to make for a plant-based version of Bob Armstrong Dip. Heat the olive oil in a medium saucepan over medium heat. Add the onion and cook for a few minutes. Stir in the grated potato and garlic, and cook while stirring to prevent the potato from sticking to the pan. Continue to stir and cook until the vegetables become tender. 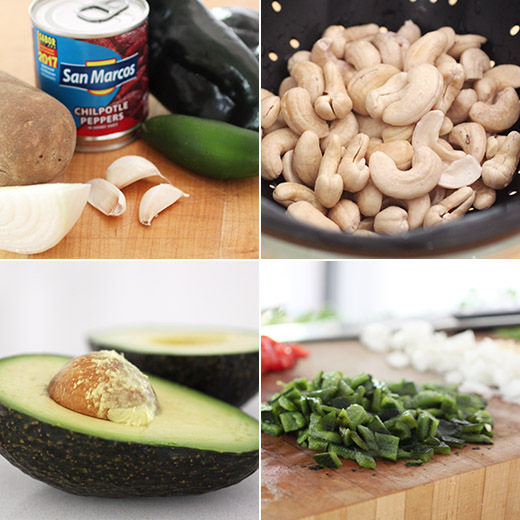 Add the spices, drained cashews, and chipotle and stir to combine. Cook for another two minutes. Transfer mixture to a blender, and add vinegar and water. Puree in the blender until completely smooth. Taste and add salt and pepper to taste. Transfer the queso mixture from the blender back to the saucepan, and add the diced bell pepper, poblano, and tomato. Heat over a low simmer just to keep warm until serving. 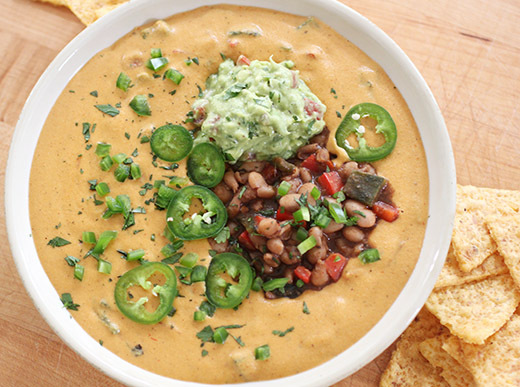 For vegetarian Bob Armstrong Dip, serve topped with guacamole, seasoned pinto beans, sliced jalapeno, and cilantro and with tortilla chips for dipping. Looks ever so delicious! This vegan version is interesting. That's a very different and delicious dip. The topping makes it so interesting. What a neat dip! I'll bet most of us have vegan friends and are always looking for new dip ideas for them. This is a winner! Thanks. I've been quite amazed by how good cashew creams and all sorts of concoctions using it in place of cheese can be... I say to those who doubt it - don't knock it until you try it... keep an open mind, it's really delicious! i feel like i'm really missing something having never tried cashew cream! what an interesting dish!